Here is the president signing the orders. President Donald Trump further solidified his love for oil, gas, and the pipelines that transport these dirty fuels with the signing of two executive orders Wednesday. The two orders are meant to limit state powers to ensure that energy infrastructure projects—pipelines, in particular—aren’t held up over state-level approval. He’s giving states 60 days to approve or deny key certifications projects need under one of the executive orders. 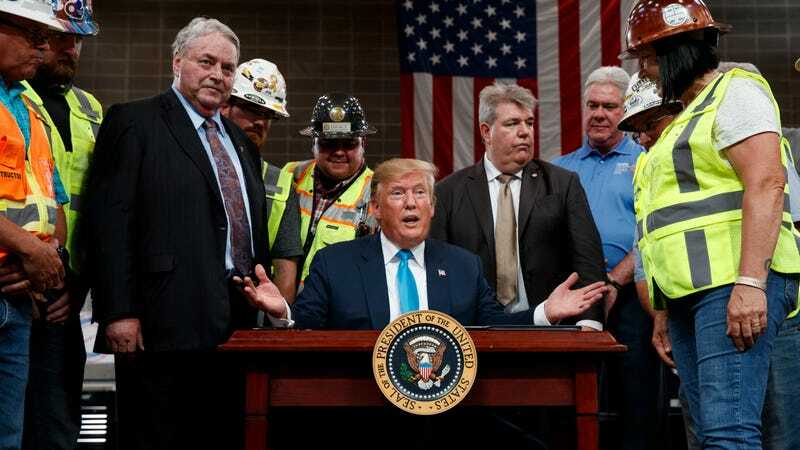 “My action today will cut through destructive permitting delays and denials,” Trump said to a backdrop of hard-hat-wearing fossil fuel workers (one of whom looked absolutely smitten by his presence). The president was in Crosby, Texas—yes, the same city that experienced that awful chemical fire last month—to formally sign these two executive orders, a move in line with his broader pro-fossil fuel energy policy. This comes just about a week after Trump’s executive order to push through the controversial Keystone XL Pipeline, an action he celebrated during his Texas announcement. The first of the new executive orders will order the Environmental Protection Agency to speed up the 401 certification process under the Clean Water Act that delegates states the power to determine if federal approval of projects meet their individual water quality standards. For an administration that touts itself on emphasizing state rights, it’s quick to strip that power when it goes against federal interests. “This administration is so intently pro-state until it’s not,” said Mark Ryan, a former assistant regional counsel at the EPA, to Earther. The second order mandates the Department of Transportation to “modernize” regulations, as Trump put it, for natural gas export terminals. What that exactly means is unclear, but it’s likely to ensure that these terminals happen regardless of what states want. This announcement is a direct response to states like New York and Washington using this certification process to deny fossil fuel projects. In 2016, New York leaders rejected a natural gas pipeline, and Washington state officials shut down a coal terminal proposal in 2017. The consequences of the new orders remain to be seen. Speeding things along, however, can only happen “at the cost of the states’ rights to certify compliance with the state water quality standards,” Ryan told Earther. And, really, how effective can a 60-day analysis be? State regulators may well need more time if they actually want to ensure local waterways will be safe. For all we know, this might result in speedy rejections of projects. The Trump administration would certainly deserve it.